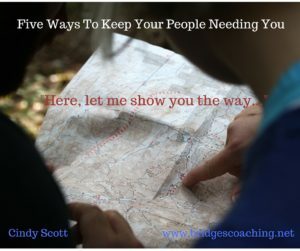 Five Ways To Keep Your People Needing YOU! 1- Go to God for them. Whether you are a pastor or parent, teacher, mentor or friend please keep in mind that you are adept in Bible reading and have had more experience praying. You’ve been a believer longer than the people you want to help, so it would be better if you just heard from God FOR them. Tell them what you think God is saying and then they will be less likely to mess up. And they will continue coming to you and you can tell them what you think God is saying. This will save them the time and bother of learning to hear from God for themselves. Plus it keeps your finger on the pulse of where things are going so you can direct things the way you see fit. 2- Share your dream so they can get onboard.